Let’s be clear, we are not talking here about networking for personal ends, collecting business cards, followers on social media, or belonging to a nepotistic old boy’s network of mutual back scratching. Sadly, the President’s Club is an example of networks gone badly wrong, where abhorrent behaviour, driven by the worst aspects of human social psychology, outweighed the social mores of wider society. What is worth noting however, is that men tend to network to get things done, while women generally network to learn. Both are necessary but neither is sufficient. At its worst, networking focused on doing leads to ill thought through actions that are needlessly repeated, while networking focused on learning becomes therapeutic rather than dynamic. We live in a networked world in which wicked problems, from global warming to terrorism and inequality, flow through interlocking webs of connection, causing volatility, uncertainty, complexity and ambiguity. Conversely, in science, technology, the environment and society, networks are becoming the paradigm with which to uncover the hidden architecture of complexity and the capacity for people, resources, and ideas to generate greater collective value. Fundamentally, networks provide a new lens through which to view organisations and communities, and a new language to help explain and act within them. The term ‘wicked problems’ was originally coined in the 1970s to describe problems of social policy that did not lend themselves to solutions through a purely scientific-engineering approach, because they were characterised by incomplete or contradictory information, large numbers of people and divergent opinions, and the interconnected nature of these problems with other problems. It has since been applied to problems from pandemics and climate change to social inequality and business strategy. In most organisations the conventional response to ‘wicked problems’ has been to sweat your assets; to demand that more and more be done with less and less. Yet however imaginative, there comes a point when there is no more money, your people are mentally exhausted and physical resources can be squeezed no further. The alternative is to recognise that nothing happens without networks. We exist within them and we work through them, but often without necessarily realising that we do. The challenge of wicked problems is exacerbated in many organisations by the assumption that every problem fits neatly into one of the departments into which they have organised themselves: and no amount of structural readjustment will solve this. However construed, organisational silos and bureaucracies drive narrow departmental approaches to problems rather than create whole organisation solutions. By making networks explicit we can see that problems and risks are rarely confined to one department or directorate, and that the solution is to do less ourselves and more with and through others, by identifying synergies and avoiding duplication of effort. The problem is perhaps most acute for public services and the voluntary sector, where success is often dependent on support and harmonisation with other organisations. To be effective, organisational efficiency must be complemented by action on the part of others in health, policing, housing and education. This requires more than simply the provision of discrete services, it necessitates community leadership to shape the places and organisations in which they serve. But whether in an organisation or a community, our approach is to build upon the concepts of social network analysis and community asset mapping to uncover value: identifying and then connecting individuals, teams, groups and institutions in order to facilitate the exchange of resources, skills and knowledge, between those who have and those who need. In the absence of such understanding individual, group and organisational effort can be needlessly duplicated, squandered or under-utilised. Before you can improve your network you need to understand it. 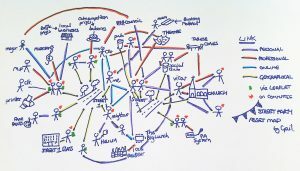 Improved connectivity, whether in organisations or communities, starts with a network map, a visualisation of the elements in your network and the relationships between them. A network map shows the nodes and links in the network, where nodes can be people, groups, or organisations, and links reveal the relationships, information flows or transactions between them. Map in hand, you are then able to help connect those who have with those who need, and target your own organisational resources more effectively and efficiently. In short, community network analysis allows organisations to target their finite resources to where the impact will be greatest and unlocking the conundrum of doing more with less. None of this will happen, however, without leadership. Left to their own devices networks develop naturally through proximity and homophily: natural human inclinations to associate with people who are near us or like us. While such bonds often contribute to a group’s strength, they can also inhibit communication between groups. Direction, however gentle or subtle is always required. Formal, positional leadership will remain important, but in a networked world leaders will increasingly be asked to lead without positional authority, across internal and external organisational boundaries. It requires leaders who can see across the whole organisation or community, and make the sum of the parts greater than the whole. Leaders who recognise that opportunities and threats do not come neatly parcelled to fit the department, division, or sector into which we have arranged ourselves. Leaders who take responsibility for problems other than their own and can lead outside the constraints of their positional authority. In short, leaders who recognise that connectivity is crucial to a sense of belonging and improved productivity in the organisations and communities in which we work and live.